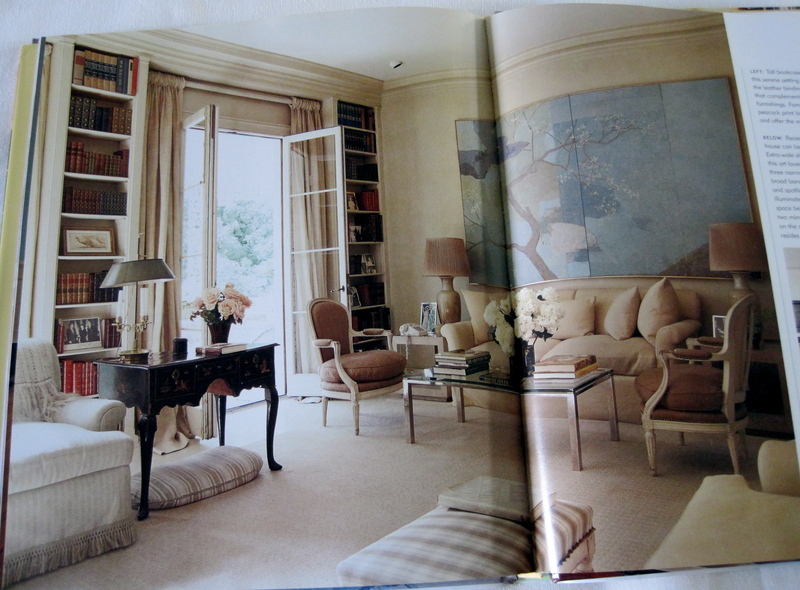 A dear friend gave me a copy of House Beautiful’s Decorating with Books by Marie Proeller Hueston, and I’ve enjoyed it so much that I thought I would share it with you. One of the things that I love about visiting other people’s homes is seeing what they have on their bookshelves—I think you can learn lots about a person by perusing their personal library. 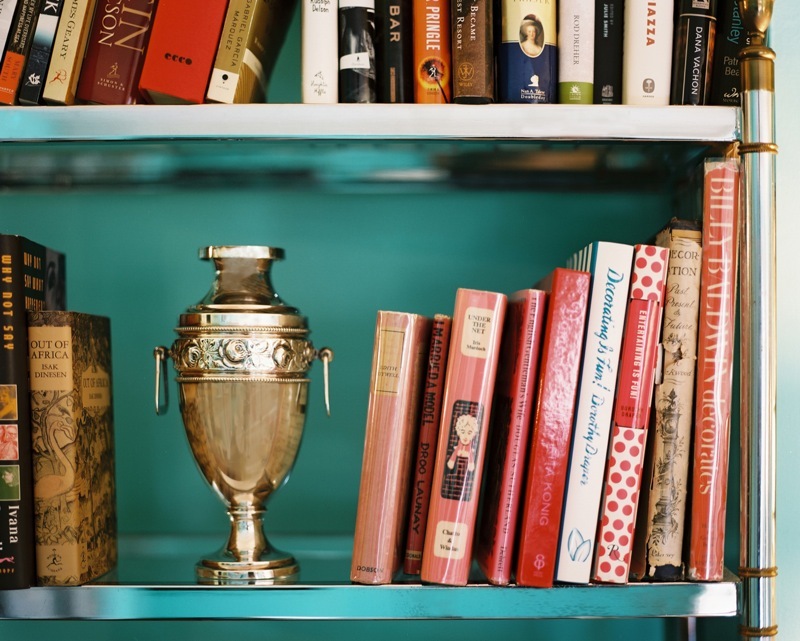 Decorating with Books is not about using books as props, but rather showcasing your personal interests—those things that make you, well, you—to best effect. 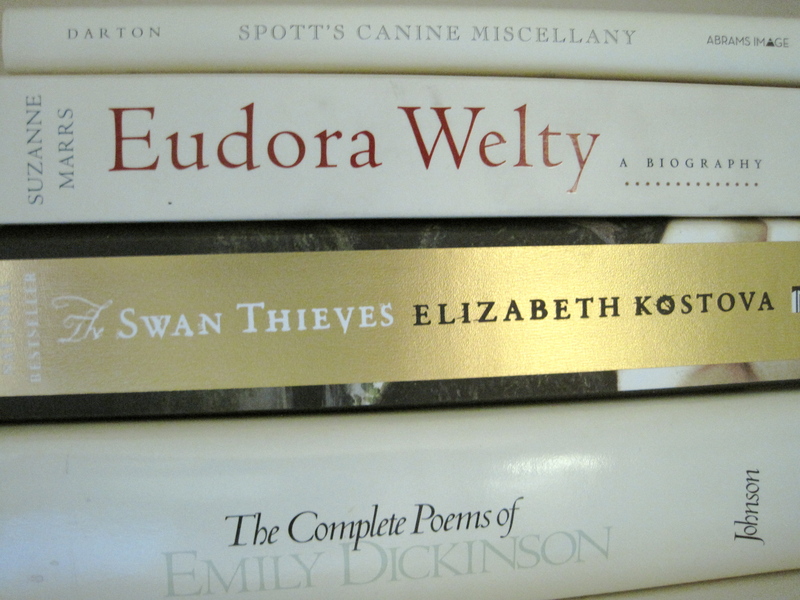 The blurb on the dust jacket flap tells us that “[w]hen used in unexpected ways, artfully arranged volumes can play a major role in your decor while they show the world your own pursuits pastimes, and passions.” I think they have something there—I really believe books are integral to making your home a true reflection of who you are. An epigram from Cicero on the book’s back cover drives home this point: “A room without books is like a body without a soul.” Dear Cicero, I couldn’t agree more! 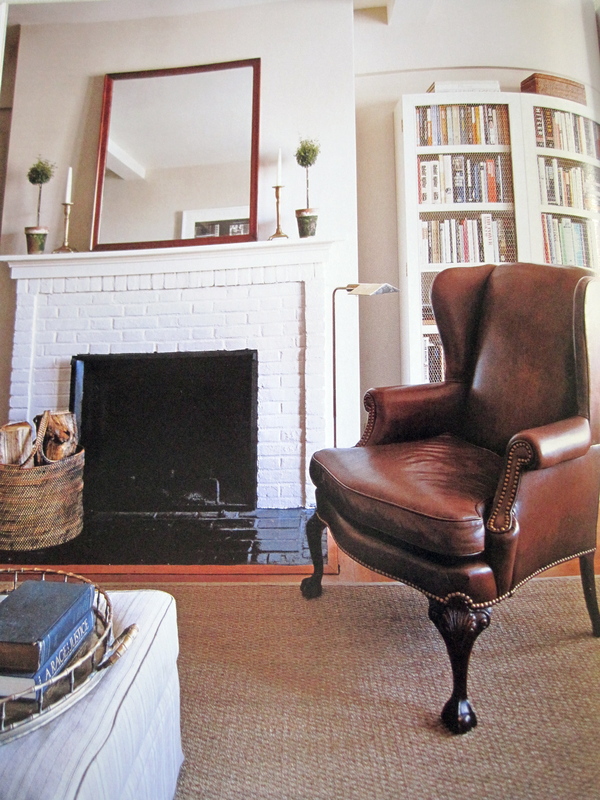 For this post, I’ve chosen some of my favorite interiors featured in the book, along with photos of my bookshelves-in-progress, plus a few extra inspiration images. First up: I love the clean lines and understated elegance of the room below, and appreciate how the bookcase in the corner provides a nice anchor for the space. Did you notice the chicken wire doors on the bookcase? 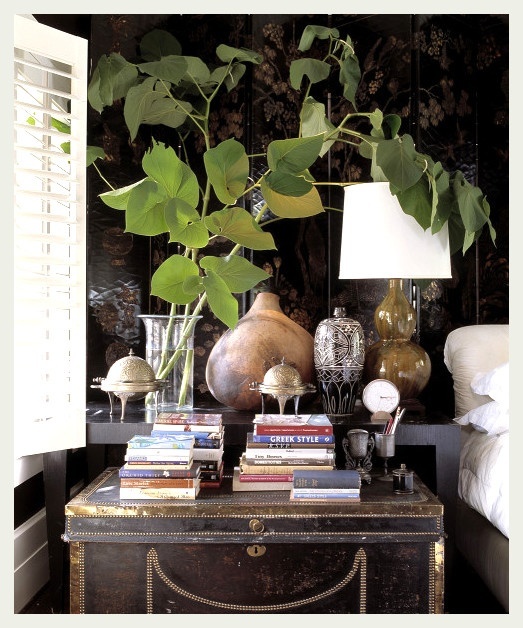 They add another textural element to the room, and, as Proeller Hueston notes, “echo the look of the sisal rug and baskets atop the bookcase and beside the hearth.” She goes on to say that “wire doors are also a good idea if fragile items are arranged among the books.” I would add that this is also a good idea if you have an extremely curious Clumber Spaniel who is prone to either drooling or surreptitiously munching on books displayed at his level, within reach of his little maw. Sadly, a beautiful and rather expensive Rizzoli book on my coffee table met this fate—it now has teeth marks on the cover—so you can see how this chicken wire idea has practical application. 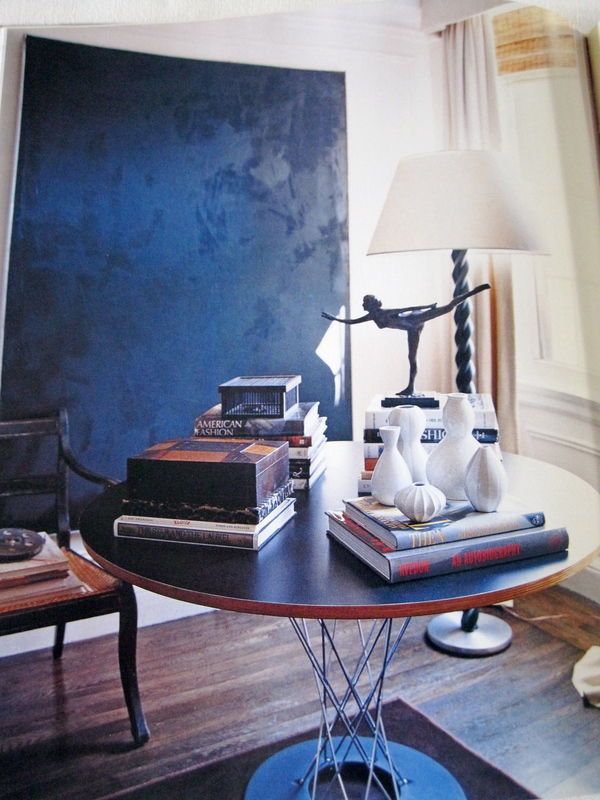 In the example below, a modern circular table is used to showcase books, decorative objects, and collections. Proeller Hueston urges us not to be afraid to add a bit of whimsy: “note that the copy of the children’s classic Eloise (in the pile beneath the wood box) shares space with books for grown-ups on art, fashion, and design.” I really love the idea of incorporating a little smile and surprise in a vignette like this, and there are so many children’s books that are works of art in their own right and worthy of display. I have a few in my own collection, and while I don’t have children myself, having a few well-chosen children’s books on hand has come in handy more than once when hosting some of my friends who have kiddos. Kids appreciate good reading material too. 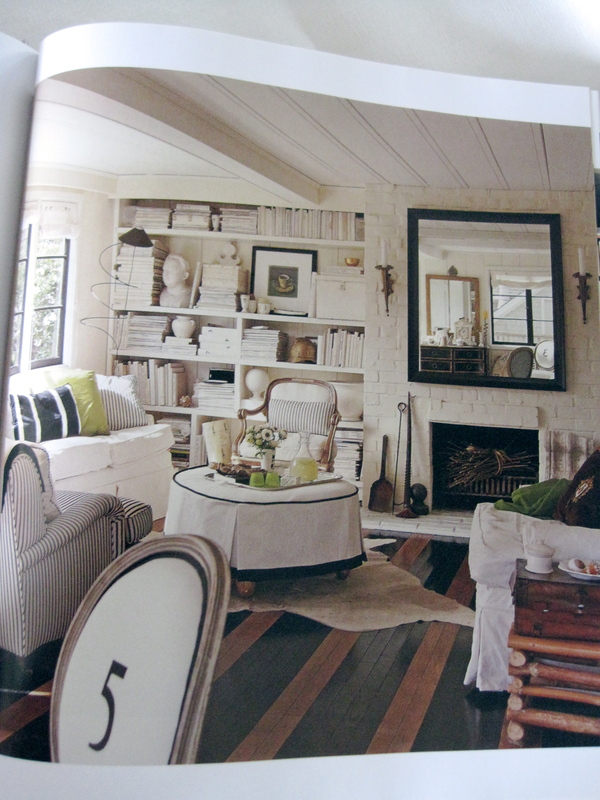 I can’t say enough about this next interior—it has shown up in other House Beautiful publications, and it’s one of my very favorites. To me, it’s the epitome of elegance. And here the books on display blend seamlessly with the rest of the room. 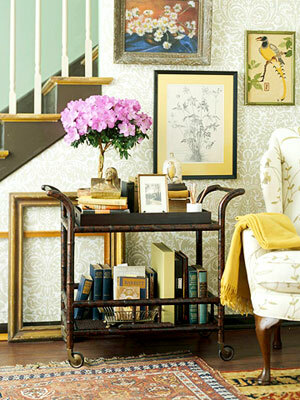 Proeller Hueston emphasizes the importance of creating some “breathing room” on your bookshelves: integrating family photographs and art prints helps to “break up the display of books and offer the eye a place to rest.” These well-ordered bookshelves certainly add to the serene setting. 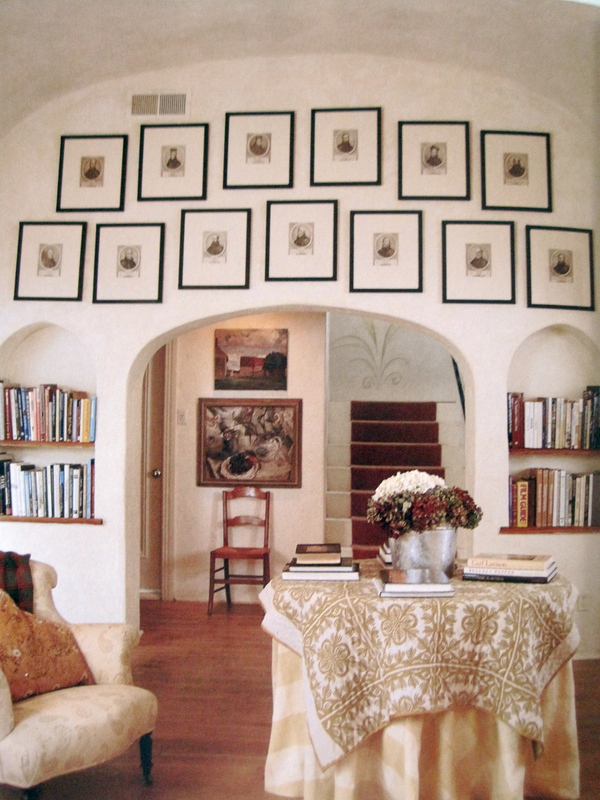 I find the small arched niches in the next example a charming way to display books. My brother has something similar in his living room, and I’m a little jealous of them! 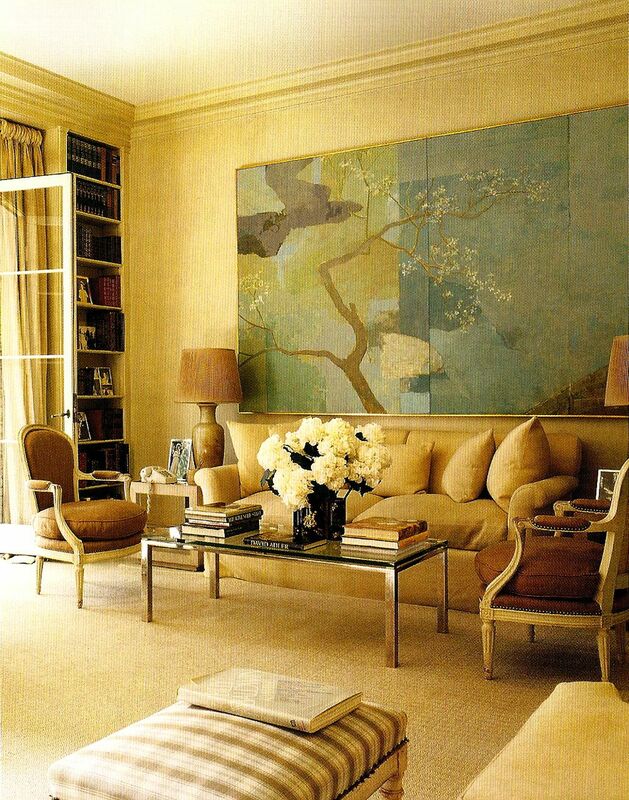 Here the “heights of the books vary from shelf to shelf, reflecting the casual feeling of the interior.” The circular table topped with soft linens and stacks of art books serves as another display space and also invites browsing. 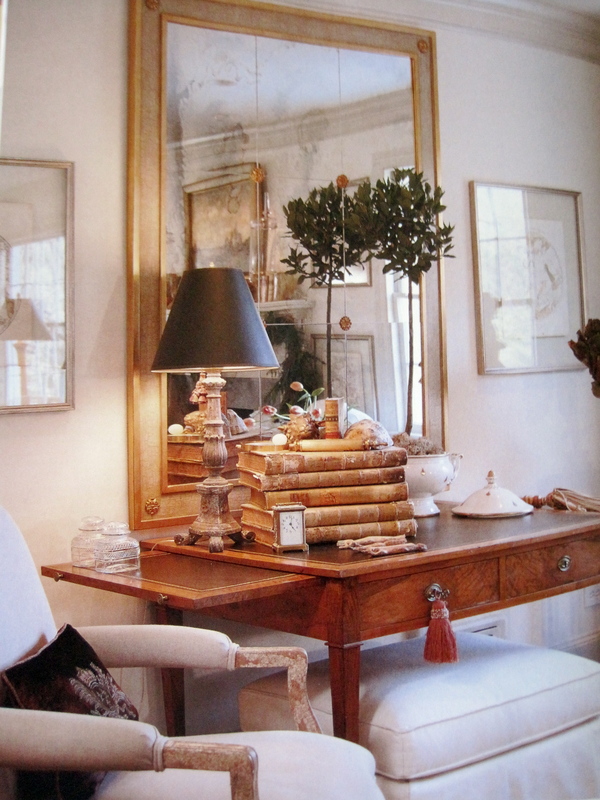 And this last example feels like the ultimate bookish retreat. Maybe it’s so appealing because it’s an all-white interior, which feels cool and soothing to me as I write this on a hot day! I can imagine doing some summer afternoon reading here and really enjoying it. I also must admit how much I love the monochromatic scheme of all the book covers—achieving this would take discipline and work (can you imagine creating covers for all those books?! ), but this photo helps convince me it would be worth it. I’ve been trying to integrate some of the pointers I’ve learned from Decorating with Books in my approach to my own bookshelves. One of my main challenges, however, is that I have a LOT of bookshelves in my home office, but my personal library doesn’t quite fill them. 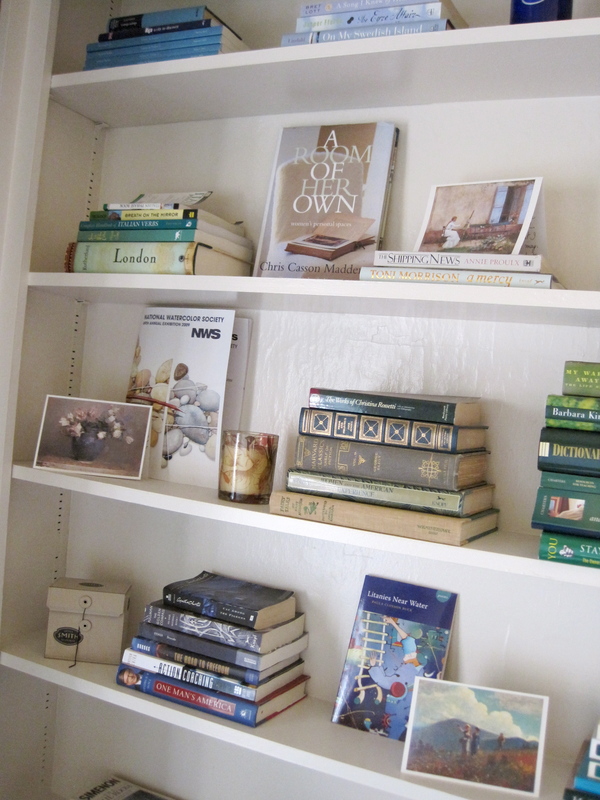 Initially, when I started adding books to the shelves, I had a lot of empty space. 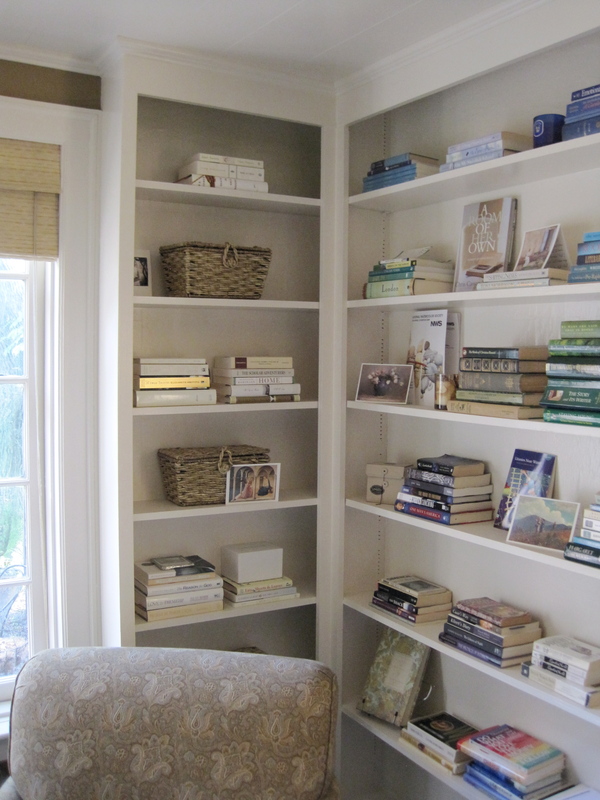 To prevent things from looking too sparse, I borrowed an idea from designer Lindsey Bond: in the home office of her Alabama cottage, she used a horizontal arrangement for her books, which I found really appealing. Things look neat and organized. And really pretty. This approach has really helped me to fill out my bookshelves, since I’m still in the process of growing my library. An added benefit is that the spines are easier to read when they’re arranged horizontally. You can see here that I’m trying my hand at weaving in texture (with baskets) and adding art to break up the space (in the form of pretty postcards and notes I’ve received from friends and family)—while trying to maintain some “breathing room.” It’s a work in progress, but it’s evolving slowly… I’ve also tried loosely organizing the shelves by color. I know that this may seem excessive in some people’s books (bad pun—sorry! ), but I find that it helps visually calm the room. 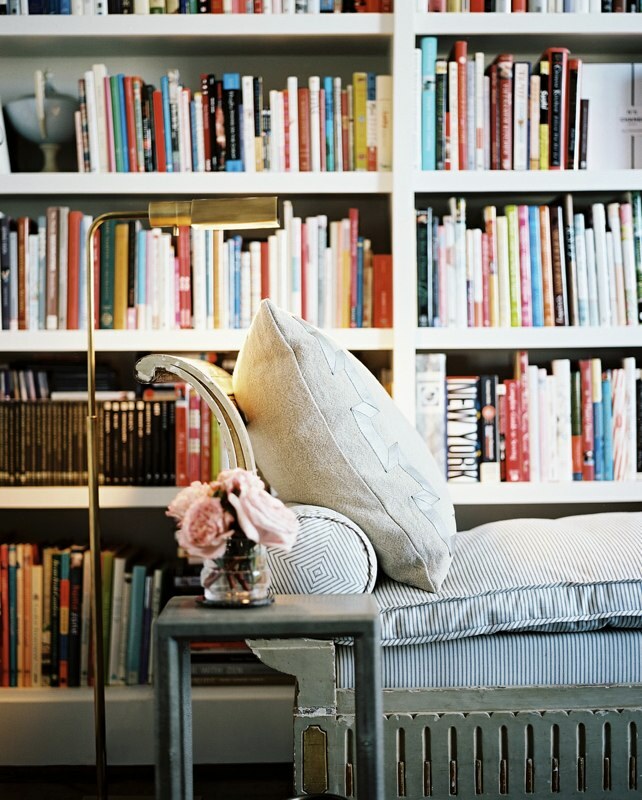 How do you like to decorate with books? I’d love to hear your ideas and tips! 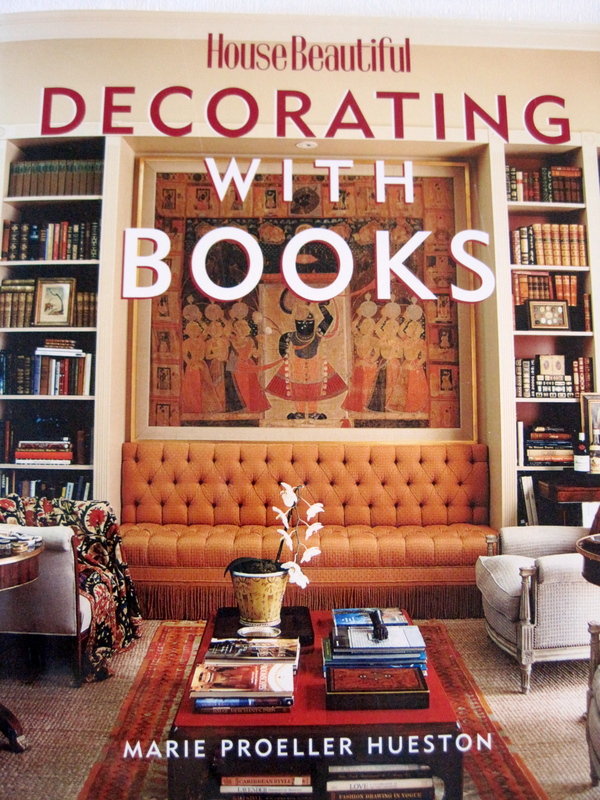 And if you’re interested in exploring more of Decorating with Books, you can order it here. Thanks for reading, and I hope you have a great start to your week! Nice post. Whenever I read about bookshelves, I am always brought back to Erik Spiekerman’s two-storey bookshelf. A great excuse to fit an electric winch to your house.